Adrian and Ceres ended their reign as league champions with a huge roar, crashing Global's coronation in the process. 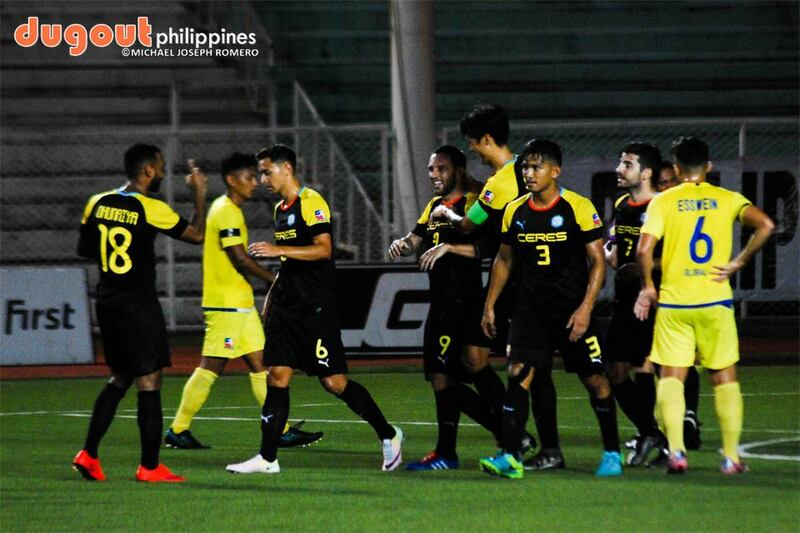 MANILA-- Even though they surrendered their crown two weeks ago, Ceres showed who's the boss Sunday evening, spoiling the coronation of Global with a 5-0 thrashing here at the Rizal Memorial Stadium. Risto Vidakovic's stint for the Busmen were given a huge lifeline, as Adrian Gallardo bagged a brace to inflict a huge scar on the chanpions' final match of the season to regain the second spot from Loyola as the Mad Rush for the precious AFC Cup spot goes on to the final weekend. Sandwiched between the Spaniard's brace were Jeffrey Christiaens, Orman Okunaiya and Bienve Marañon, whose goals contributed to their first league win against the champions in the fourth time of asking since last season. John Burridge and Global were caught by the championship hangover and they paid dearly for it, as they only take a total of three shots and gave up more posession althroughout the match, with their lack of discipline compounded their woes as they played the rest of the way with ten men for just their second setback all season. At the outset, Ceres made its intentions crystal clear just eight minutes in, as Stephan Schröck almost caught Patrick Deyto off his line, but his shot from the halfway line was denied by the crossbar. Not to be outdone, Global tried to put the ball on the net before the half-hour mark, but Hikaru Minegishi's header was saved by Louie Casas. The aggresive play by the Busmen finally bore fruit in the 38th minute, as the league's leading scorer gets the first of his brace by pouncing on a goalmouth scramble and fired the loose ball past Deyto, sending their supporters in full Fiesta mode that set the tone for the night. Four minutes later, Christiaens haunts his former club by doubling Ceres' lead with his shot from a very tight angle that left Deyto no chance to save it. The worst for the champions came deep into first-half stoppage time, with Arthur Kouassi's dismissal on his second bookable offence reduced them to ten men. Ceres tripled their edge just two minutes into the restart, with Adrian turning provider to the Northern Irishman who duly thumped it from close range. The Busmen's speed was evident on the counter, and produced another one in the 80th thru Bienve who chipped it in for 4-0. Gallardo capped off their rout with another close ranged hit for his brace, with Ceres ended their defence of their league with a resonding bang as their focus shifts on bagging the second spot that meant a return to AFC football next year.